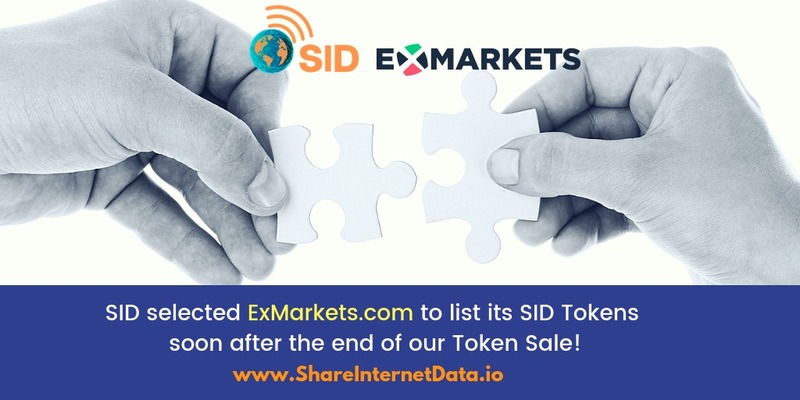 GIBRALTAR, Gibraltar - Feb. 10, 2019 - PRLog -- ExMarkets will host the SID Token (SIDT) for sale on the new and polished LaunchPad of the ExMarkets.com exchange during the last 4 weeks of the SID token sale period, ending on 31st March 2019, allowing only buying trades. SID Limited (SID) will then be listing its token allowing buy and sell trades tentatively set for May 2nd, 2019. SID, which stands for "Share Internet Data" uses the SID utility token (SIDT) which is based on Stellar's blockchain with its product already released commercially. With its Android APP incorporating a stellar wallet that allows to trade mobile internet data for SIDT in a P2P manner between nearby Android smartphones. Sharing WiFi internet and encrypted passwords of WiFis entered by users themselves will for now remain free for both Android and iOS SID-APP users. So jump to ExMarkets.com and register an account and set up your path to acquire SIDT once it goes live in the next few weeks! Funds collected during the ITO will be channeled to further product development and geographical expansion. Jose Merino, Chairman of SID Limited states: "The SID market opportunity is there for grasping as it is combining both the smartphone and the Wi-Fi markets all in one. Some market data: According to Statista, in 2018 Smartphones numbers are outperforming public Wi-Fi hotspots by 5.3B to 0.279B meaning by more than 18 to 1. These figures clearly show the importance we give to Share Internet Data (SID) through smartphones as being the core of our SID platform technology accessed through our SID APPs and through our future commercial customers SDKs like Dunkin Coffee." "SIDT is a clear top-runner in terms of other token sales that are live at the moment, they have a comercial released product, they also have commercial clients such as Dunkin Coffee, a US patent office grant notice and several pending patents. I mean they have a lot of things going on for them. That's why we're really excited to be able to offer SIDT to our ExMarkets community" - L. Bourquin, COO at CoinStruction. The whole team here at ExMarkets is excited to host the SIDT sale on ExMarkets LaunchPad and are grateful for the opportunity to contribute and help make this altruistic project to escalate and provide a market for its native token. ExMarkets is a part of CoinStruction liquidity framework which is aggregating order-books from the most well-known cryptocurrency exchanges guaranteeing 24/7 crypto liquidity — a feature which can seldom be seen in the current market. International Joint Venture Launching the Blockchain Ecosystem for emerging markets!